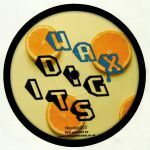 Review: The third multi-artist EP from Hot Digits' occasional vinyl series, Wax Digits, is packed to the rafters with dancefloor-focused re-edits and reworks. Labor Of Love leads the way with "Move That Thang", a fine chunk of warm and bass heavy deep house/disco fusion, before Osmose steals the show with the loopy mid-tempo disco-funk bump of "Let Harry Rock". Over on Side B, The Silver Rider impresses via the swirling disco-house hypnotism of 'Groove On Down", before experienced re-editor P-Sol pairs locked-in grooves with sun-kissed disco instrumentation and heady vocal snippets on "Sturdy Disco".